another interesting piece by Naomi Klein..... greed wins again....man it's tough to view these people as members of the human family....i keep thinking "don't they have children and grandchildren???" i guess they figure their descendents will be in the fortified green zones and safe from the destruction of the climate of planet earth.....how much longer will the greedy, power drunk elite be allowed to dictate suicidal policy to the many and send us the bill.??? sector, as many do, than clean energy." .....Put simply, in the world of venture capitalism, there has been a race going on between greens on the one hand and guns and garrisons on the other--and the guns are winning. .......Of course, there is still money to be made from going green; but there is much more green--at least in the short term--to be made from selling escape and protection. As Lloyd explains, "The failure rate of security businesses is much lower than clean-tech ones and, as important, the capital investment required to build a successful security business is also much lower." In other words, solving real problems is hard, but turning a profit from those problems is easy. It seems like just yesterday that Republicans held a majority in the Senate and were screaming about Democrats using the filibuster to block some of Bush's judicial nominee's... The Republicans even threatened to change the time honored rules of the Senate and do away with the filibuster, using what they called the nuclear option. But that was the 109th Congress. Now just one year into the 110th Congress, the Republican minority has set an all time record for filibustering. Senate Republicans sure are exercising situational ethics and showing a total disregard for the welfare of our Nation. In today's "Profiles In Obstructionism" we honor the Minority Senate Republicans of the 110th Congress, who in just half a congressional session, have filibustered more bills than any Congress in history. Darcy Burner, Democratic candidate for WA-08, is holding a fundraiser. She's trying to raise another $25,000 before the end of the year... which is midnite Monday. Help her out if you can. We need to do all we can to increase the Democratic majority in Congress... and since WA-02 is already blue, helping replace Dave Reichert (R) with Darcy Burner is something local we can do. There are still way to many Republican politicians obstructing progress. in memory of a courageous strong woman who tried to speak and act to make our world a more peaceful just world for the people of her country and the world. my thoughts are with her children and family. we will not forget. and this bombshell...... scooby do moment...no follow-up??? holy crap!! caging and proud of it!!! 2007 has been a busy year for the Kansas Republican Party. We have taken the last 11 months to rebuild our party operations, make technology updates, build our fundraising database, and identify voters. We have also put operations in place to make the Party a more effective organization to support candidates, and better able to provide rapid campaign response in every county in the state. Much has been made of the reduced violence in Iraq. The Bush administration has propagandized that "the Surge" has worked and much of the mainstream media has dutifully repeated the administrations talking-points. Bush announced that the purpose of the Surge was to give the Iraqi government breathing space to achieve the benchmarks that had been set for them. The Fact is that there's been no progress what-so-ever. BAGHDAD - Now that the security situation has improved in Baghdad, everyone here is wondering if the dismal political situation can improve, too. The goal of the U.S. military "surge" was to create a more secure atmosphere that would enable Iraqi political leaders to figure out how to reconcile. Indeed, a political "surge" is badly needed. It is the ticket to creating a viable Iraqi army, and to stabilizing the country. That, in turn, is the key to drawing down U.S. troops. It's clear that once again the Bush administration has moved the goal-post closer and claimed to have scored a point. 10. Myth: The US public no longer sees Iraq as a central issue in the 2008 presidential campaign. 8. Myth: The US troop surge stopped the civil war that had been raging between Sunni Arabs and Shiites in the Iraqi capital of Baghdad. Fact: The civil war in Baghdad escalated during the US troop escalation. Between January, 2007, and July, 2007, Baghdad went from 65% Shiite to 75% Shiite. UN polling among Iraqi refugees in Syria suggests that 78% are from Baghdad and that nearly a million refugees relocated to Syria from Iraq in 2007 alone. This data suggests that over 700,000 residents of Baghdad have fled this city of 6 million during the US 'surge,' or more than 10 percent of the capital's population. Among the primary effects of the 'surge' has been to turn Baghdad into an overwhelmingly Shiite city and to displace hundreds of thousands of Iraqis from the capital. 7. Myth: Iran was supplying explosively formed projectiles(a deadly form of roadside bomb) to Salafi Jihadi (radical Sunni) guerrilla groups in Iraq. Fact: Iran has not been proved to have sent weapons to any Iraqi guerrillas at all. It certainly would not send weapons to those who have a raging hostility toward Shiites. (Iran may have supplied war materiel to its client, the Supreme Islamic Council of Iraq (ISCI), which was then sold off from warehouses because of graft, going on the arms market and being bought by guerrillas and militiamen. 6. Myth: The US overthrow of the Baath regime and military occupation of Iraq has helped liberate Iraqi women. Fact: Iraqi women have suffered significant reversals of status, ability to circulate freely, and economic situation under the Bush administration. 5. Myth: Some progress has been made by the Iraqi government in meeting the "benchmarks" worked out with the Bush administration. Fact: in the words of Democratic Senator Carl Levin, "Those legislative benchmarks include approving a hydrocarbon law, approving a debaathification law, completing the work of a constitutional review committee, and holding provincial elections. Those commitments, made 1 1/2 years ago, which were to have been completed by January of 2007, have not yet been kept by the Iraqi political leaders despite the breathing space the surge has provided." The polling shows that "the Iraqi government has still made no significant progress toward its fundamental goal of national reconciliation." 3. Myth: The Iraqi north is relatively quiet and a site of economic growth. Fact: The subterranean battle among Kurds, Turkmen and Arabs for control of the oil-rich Kirkuk province makes the Iraqi north a political mine field. Kurdistan now also hosts the Kurdish Workers Party (PKK) guerrillas that sneak over the border and kill Turkish troops. The north is so unstable that the Iraqi north is now undergoing regular bombing raids from Turkey. 2. Myth: Iraq has been "calm" in fall of 2007 and the Iraqi public, despite some grumbling, is not eager for the US to depart. Fact: in the past 6 weeks, there have been an average of 600 attacks a month, or 20 a day, which has held steady since the beginning of November. About 600 civilians are being killed in direct political violence per month, but that number excludes deaths of soldiers and police. Across the board, Iraqis believe that their conflicts are mainly caused by the US military presence and they are eager for it to end. 1. Myth: The reduction in violence in Iraq is mostly because of the escalation in the number of US troops, or "surge." Fact: Although violence has been reduced in Iraq, much of the reduction did not take place because of US troop activity. Guerrilla attacks in al-Anbar Province were reduced from 400 a week to 100 a week between July, 2006 and July, 2007. But there was no significant US troop escalation in al-Anbar. Likewise, attacks on British troops in Basra have declined precipitously since they were moved out to the airport away from population centers. But this change had nothing to do with US troops. Naomi Klein's book The Shock Doctrine deserves repeat recognition for the year. if we understand what is happening to us we can resist shock. she believes our best defense is to know what is happening to us and why. i think it is important at this time of year to reflect and for me that means asking who we are? who are the terrorists? i never imagined we would be debating whether torture should be used. i want to be optimist that we will be able to join with all other humans on planet earth and save our home for future generations. when a small group of people seize power and wealth to use whatever means necessary to advance their goals it can cause great suffering for many, as in Iraq and New Orleans. this is a most important book for our time. there are no green zones planned for most of us. 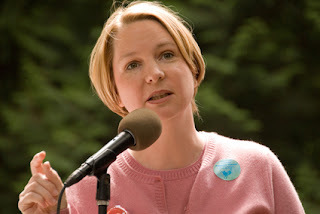 From the Seattle PI, Congressional candidate Darcy Burner discusses toxic toys. Is the toy you gave safe? how hard it is to explain to a 5-year-old that his favorite toy is poisonous? That these products made it onto store shelves -- and into our homes -- is bad enough. Even worse, many children's products still contain high levels of lead and cadmium. Parents have a right to expect that their children's toys are safe. Unfortunately, as toy after toy was recalled, parents -- myself included -- have grown increasingly worried this holiday season. disturbing, to say the least. Of the 479 toys tested, 47 items -- 10 percent of the total -- contained lead levels beyond the 40 parts per million maximum that the American Academy of Pediatrics considers safe. Nine items tested positive for cadmium, also toxic. A red plastic Lincoln Logs roof tested at 1,488 parts per million for lead (37 times the AAP maximum). A plastic Sesame Street Bert figure tested at 5,346 ppm (133 times the standard). A Tinkerbell pink rolling backpack tested at 533 ppm. A Winnie the Pooh place mat contained 985 ppm. A Fisher Price Flip Track crane owned by my son tested at 10,600 ppm, or 265 times the AAP standard. The children's character place mats tested contained high levels of lead: Dora, Spiderman and Winnie the Pooh all tested positive. Cooler-style lunchboxes and soft coolers had high lead content as well. None of these items has been recalled. It's not enough to know whether your toys were in the 77 separate recalls so far this year; parents should be suspicious of every plastic toy, painted toy, mug, plate, cooler, place mat and bag your child encounters. No one has been ensuring they are safe for our children. Why is this happening? The answer is clear -- the Consumer Products Safety Commission has been gutted. In 1980, 978 people worked there; now the CPSC has only 400 employees to monitor 15,000 categories of products, and only one is assigned full-time to test toys. Meanwhile, the current CPSC head (a former industry lobbyist) and her predecessor took nearly 30 lavish junkets paid for by industries they oversee. Think about it -- children are being put at risk while those tasked with keeping them safe are too busy hobnobbing in resort locales with toy industry lobbyists. This is a scandal, but it is also just business as usual in Washington, D.C., where regulatory agencies have been starved of resources and put under the control of political appointees with cozy industry ties. Change may come, albeit too slowly. This week the House of Representatives unanimously passed legislation that will modestly expand the CPSC's resources and gradually tighten the outdated federal allowable lead limit to 100 parts per million. Even if this bill survives -- the Senate has not acted -- it too little, too late. The House standard is still more than double what the American Academy of Pediatrics recommends -- and toy manufacturers will be given four years to get there. That is not good enough. Our elected leaders in the other Washington must make a real commitment to better testing and enforcement of toy safety laws. In the meantime, parents are stuck playing a game of toxic Russian roulette with the toys they buy their children. Darcy Burner is the Democratic candidate for Congress in the 8th Congressional District. Authoritarians are always interested in controlling communications and stifling free speech. ... Beijing police will work with government agencies and telecommunications companies to investigate and punish those using text messages to "spread rumors" or "endanger public security," the city government said in a notice posted on its Web site late last month. But don't be fooled, the Chinese Communists aren't the only authoritarians busy trying to control communication. The National Labor Relations Board has ruled that employers have the right to prohibit workers from using the company’s e-mail system to send out union-related messages, a decision that could hamper communications between labor unions and their membership. In a 3-to-2 ruling released on Friday, the board held that it was legal for employers to prohibit union-related e-mail so long as employers had a policy barring employees from sending e-mail for “non-job-related solicitations” for outside organizations. ... Some comments may be posted online at our discretion. Locally there's been a great deal of conversation about mean, ugly and down-right libelous blog comments. On the local newspapers website, that's a legitimate discussion. But it's utter hypocrisy coming from News/Talk Radio KGMI, which broadcasts local and syndicated right-wing talk. Ugly personal attacks, intentional misinformation and eliminationist propoganda are the stock-in-trade of right-wing talk-radio. KGMI is part of the problem, it incites it's conservative listeners to mean spirited incivility. WATERLOO --- New Mexico Gov. Bill Richardson said Thursday the Iraq war remains one of the nation's paramount issues and obstacles to progress, despite receiving less play from major national media and other presidential candidates. Richardson, a Democratic presidential hopeful, said during a town hall meeting in Waterloo that the war has drained resources, including time and money, away from many of the major problems still facing the country. CEDAR RAPIDS — Twelve months ago, Bill Richardson said the 2008 presidential election would be all about Iraq. Twelve days out from the leadoff event in the nomination process, the New Mexico governor said the election is still all about Iraq, and he's not going to let his rivals for the Democratic nomination avoid it. Although the EPA staff unanimously recommended approval and the EPA had never denied a waiver, EPA head Stephen Johnson said no to California. A matter of Republican politics instead of the rule of law. Environmental Protection Agency Administrator Stephen Johnson overruled the unanimous opinion of his legal and technical staff in blocking California's effort to cut greenhouse gases from cars and trucks - a new revelation that California officials say shows his decision was based on politics, not the law. December 19, 2007 - 1:57pm. On this historic yet soon-to-be infamous day of record-breaking conservative obstruction, our "Block and Blame" report (PDF) reminds me of Sen. Trent Lott's all-too-candid words from April, "The strategy of being obstructionist can work or fail ... and so far it's working for us." It's certainly true, if not terribly insightful, that obstructionism can either work or fail. Conservative Christians - Holier Than ... HIM? Mitt Romney, Mike Huckabee, and Tom Tancredo have all picked up a liberal endorsement they may not like - let's set the record straight! September 25, 2007 - 8:48pm. One of the most important pieces in Western Civilization history is being auctioned off in New York City in Mid December. Sotheby's Auction House will auction off the Magna Carta, a 2500 word document that was the forerunner to the United States Constitution. Experts expect the document, which Ross Perot bought for $1.5 Million in 1984, to be sold for over $30 Million dollars. The Perot foundation will use the money raised for, "medical research, improving public education and assisting wounded soldiers and their families." Numerous copies of the Magna Carta were issued at the time and others still exists. The Australian government has a 1297 copy, the same year the one that will be sold was created. The Master Copy of the document, sealed by King John in 1215, is unable to be located but other copies exist. Only 2, the Australian copy and Perot's, are held outside of Britain. Perot's is the only one that is held by a private citizen in the world. The Magna Carta translates from the original Latin to the "Great Paper". The Magna Carta required the English King to renoucne rights after a political disagreement between Pope Innocent III, King John and the English barons. The document most notably brought life to the right of Habeas Corpus. at Sotheby’s in New York. He has paid $8,528 a word. interesting since i just heard how Obama had been schooled in one of those evil schools....course my mom does get her news from fox. Another case of fake victimhood coming from conservatives. A conservative college student pretends to be assaulted and the conservative blabbosphere uncorks a wind-storm of indignation... and then quietly scrubs it from their websites when the hoax is exposed. by liberal brownshirts simply for speaking out in favor of traditional morality. correct" vanguard of liberal identity politics. threats to his cinematic description of his latest victimization. I picked up this story by way of Orcinus where Dave Neiwert writes about being 'called-out' by a Redstate.com wing-nut. This conservative outrage over faked victimhood seems oddly familiar. It seems like just the other day that our local conservatives were complaining that they are an oppressed minority because they can't get their candidates elected. Oh... wait, that was just the other day! Looks like the conservative strategy is to fake being oppressed in an attempt to get special rights. The news from GoLeft TV... because we can. Sometimes it's worth stretching a little, intellectually, and having a look at how others see us, Americans and our candidates. Campaigning means announcing a bold political architecture and not outlining a seating chart for the coming years, her critics say. But Hillary Clinton refuses to yield. Anyone who has spent an evening with her knows that she is polite, precise, hungry for knowledge, energetic and disciplined. But she is by no means a visionary. Her pragmatism is of the brittle variety. Unlike German Chancellor Angela Merkel, who sometimes seems similarly rigid in her daily routines, Hillary Clinton never allows even the slightest hint of subversive humor to cross her lips, not even in the smallest of groups. For that reason she is too cautious, too mistrustful. One could almost believe that it was Clinton, not Merkel, who spent her formative years in East Germany. Her constant could haves, should haves and would haves, her mastery of the art of qualifying everything she says, and the fact that if she does walk a tightrope, it is never far from the ground and just a few inches above a political safety net -- all of this makes her a formidable opponent. Democrats are still working hard to make a positive contribution to America. Meanwhile (emphasis on MEAN), Bush has pridefully vetoing SCHIP... again - and Republican Senators are filibustering everything . The American people haven't missed the fact that Republican control of the Federal government has brought us two military conflicts that are stalemated and an economy that is on the verge of collapse. CNN/Opinion Research Corporation Poll. Dec. 6-9, 2007. "Who do you think is currently winning the war in Afghanistan: the U.S. and its allies, the insurgents in Afghanistan, or neither side?" "Who do you think is currently winning the war in Iraq: the U.S. and its allies, the insurgents in Iraq, or neither side?" Congress are doing their job?" Democrats in Congress are doing their job?" 2008 is the year to put a progressive Democrat in the Whitehouse and increase the Democratic majority in Congress. There's an awful lot of work to be done to undo the mess Republicans have made. The Washington Democratic Party Precinct Caucuses will be Saturday, February 9th. I've heard some people complain about caucuses, saying it's only for activists. Well... if you are a Democrat or are at least willing to join up for the day, then caucus is where you, personally, get to be part of selecting who the Democratic Party's Presidential Candidate will be. It seems to me that's worth being an "activist" for an afternoon, once every four years. February 9th, 2008 beginning at 1:00 pm. The caucuses are a grassroots process where Democrats come together across the state in order to voice their opinion about which candidate should represent the Democratic Party in the 2008 Presidential Election. The caucuses also provide an invaluable opportunity for building the party in preparation for our 2008 election efforts and will give attendees the chance to introduce resolutions on issues about which they are concerned. Iowa's theocracy crusader Rep. Steve King(R) and other self-proclaimed protectors of the faith are out in force this year, doing all they can to making sure that no one is going to enjoy the Holiday Season. King managed to get a theocratic propaganda piece disguised as a resolution celebrating Christmas put up for a vote in the U.S. House of Representatives... and the so called news is that Jim McDermott voted NO. Never mind that Kings resolution crosses the line into promoting a religion in violation of the 1st Amendment of the U.S. Constitution... All but 9 members of the House voted Yes, because King's resolution was a "gotcha" trick intended only to further rightwing political aims. For King and his ilk, Christianity is merely a vehicle for their authoritarian political goals. With a huge majority of Americans being Christians of one sort or another, only a mental defective could believe that Christians are a persecuted minority and yet decrying "the War on Christmas" and other fantasies of Christian victimhood is a thriving industry. I've been hearing about this "War on Christmas," so I headed to the Heritage Foundation the other day for a briefing from one of the defending army's generals: Fox News anchor John Gibson, author of "The War on Christmas: How the Liberal Plot to Ban the Sacred Christian Holiday Is Worse Than You Thought." Gibson -- and Bill O'Reilly, his comrade in the Fox-hole -- see this as a two-front war: Assaulting Christmas from the government end, they say, are pusillanimous school principals, politically corrected city managers and their ilk, bullied by the ACLU types into extirpating any trace of Christmas from the public square. Battering the holiday from the private sector are infidel retailers such as Target and Wal-Mart, which balk at using the C-word in their advertising in favor of such secularist slogans as "Happy Holidays." The assault, Gibson told the Heritage crowd, has reached a "shocking level this year." Local rightwing talk radio station KGMI even got in on the faux victimhood act the other day when morning co-host Patti Brooks wrote, on the station website, a declaration of her intention to wish people a Merry Christmas. She announces that, "I never have, nor will I ever be politically correct...". I suppose the shut-ins who listen to KGMI and read it's website will be comforted in the knowledge that Patti will be out there bravely wishing people 'Merry Christmas' in the face of no one really caring whether she says that or 'Happy Holidays' or 'Seasons Greetings' or just keeps her mouth shut. Republican Presidential candidate Mike Huckabee may have improved his standing with ultra-rightwing xenophobic racist nut-cases by announcing that he's been endorsed by anti-immigrant Minutemen founder Jim Gilchrist. COUNCIL BLUFFS, Iowa -- Huckabee announced this morning the endorsement of Jim Gilchrist, the founder of the anti-illegal immigration and border security group the Minutemen. More to come. Chuck Norris's endorsement and the accompanying cutesy commercial gave Huckabee an image boost, making him seem more 'regular guy'. The Gilchrist endorsement exposes either a racist side to Huckabee or a shortage of moral principles. The Whatcom Republican Party has put out a press release, stating that they object to an action by the County Council that will send the issue of County-wide vs. District-only voting for County Council seats to the voters in 2008. It's no surprise that the Whatcom Republican Party is unhappy. The District-only voting Charter Amendment that passed in 2005 was a Republican plot. When County Council member Barbara Brenners proposed letting the voters revisit the subject, Whatcom Republicans sent out an email alert which said; "the Whatcom County Charter Review Commission voted 8-7 in favor of referring a Charter Amendment ... With strong support from the Whatcom County Republican Party, at heavy expense to our treasury, the voters approved passage of the Charter Amendment..."
They made it clear that they supported the amendment, but didn't bother to mention that it was Republican Party activist on the Charter Review Commission that proposed the Charter Amendment and just barely managed the majority needed to have it forwarded to the voters for consideration. So let's get real about why District-only voting went before the voters in the first place. It was because the Republicans candidates weren't getting elected, so they worked out a scheme to change the rules. Opinion Editor Scott Ayers pointed out in a recent post on his Bellingham Herald blog that in the 1990's the County Council had a right-leaning enviro-unfriendly majority. Whatcom County voters got rid of that majority and haven't shown any interest in going back. So the Whatcom Republicans answer to that was to tilt the playing field by introducing district-only voting. It's no wonder they're upset about the issue going back to the voters, this time the voters might see that the Republican Party intended to rig the game. once again Scott Ritter speaks truth to power. i hope the next administration will be offering him a very high level position in the defense or intelligence dept. he could help tremendously to guide our nation out of this despicable, dangerous position the current administration and to a large extent several administrations before them have taken us. if he had been Secretary of Defense the last 7 years we would not have pursued an illegal preemptive attack and occupation of Iraq. if he had been in charge of the Intelligence Dept the attacks of 911 may not have happened and if they had, the perpetraters would long ago have been brought to justice. Scott Ritter: Cheney's Iran Policy Still Stands : never mind the facts on the ground. people to destroy the careers of their warmonger representatives. See! See! I told you so! Dino Rossi's "Forward Washington"/stealth-campaign isn't ethical. The PDC voted 3 to 2 to dismiss the complaint but they were unanimous in saying that Rossi was exploiting a loophole to get around our campaign laws. The Public Disclosure Commission voted 3-2 today to dismiss a complaint against Republican gubernatorial candidate Dino Rossi that alleged he had used his non-profit foundation as a way to campaign without having to disclose his donors. But that doesn't mean the commissioners were convinced it wasn't an attempt by Rossi to dodge campaign laws. PDC executive director Vicki Rippie told me that even those commissioners that voted to dismiss worry about a loophole in the law that allowed Rossi to conduct political activity with the non-profit Forward Washington Foundation. "There's concern on the part of all commissioners that the statute as written does not address all of the political activity that is taking place today ... with Forward Washington. ... None of them were totally comfortable with the activity that occurred." Last night at the Whatcom County Council meeting: After taking public comment, the Council adopted Ordinance #2007-069 proposed by Councilwoman Barbara Brenners. This will put the question of Countywide voting for County Council Seats on the November 2008 ballot. Jpeg and I went to the Council meeting to observe and it turned out to be well worth the trip into Bellingham. During the public comment session, in spite of efforts by the Whatcom County Republican Party to whip up opposition, very few spoke against putting the proposed Charter Amendment on next years ballot. Those few Republicans/conservatives who did speak against it were amazingly hostile toward the Council and their arguments were just plain out-there. It seems they have a theory, based on right-wing talk radio demagoguery, that angry right-wing white-guys are an oppressed minority. One of the angriest-guys who spoke had made the mistake of calling and emailing Barbara Brenner in advance of the meeting to expound his theory that "rural conservatives" were being discriminated against in violation of the 1965 Voter Rights Act. After his openly hostile three minute diatribe, Councilwoman Brenner responded to him. She explained that she had respected his concerns, as she does with all her constituents, and looked into it by call the Civil Right Division of the U.S. Justice Department. What she found out was that his assertions of discrimination were total malarkey... but Barbara worded it in a more diplomatic way. I've spent some time thinking about and researching the 'conservatives' claims that (liberal) Bellingham voters unfairly dominate Whatcom County government. What I found is that they have created a mythology to explain away their lack of political success here in Whatcom County. The actual facts are that of 102,458 registered voters in Whatcom County, only 37,652 live in the city of Bellingham. That's 37.75% of Whatcom County's voters. I don't know how many of those Bellingham voters are 'liberals', but a sizable majority consistently vote Democratic. So that would appear to make 'liberal' Bellingham voters about 25% of the County's total registered voters. Another claim of the 'conservatives' is that the Council is dominated by peole who live in Bellingham. Again the facts say different. Only two County Council members live in Bellingham, the other five live in unincorporated (rural) Whatcom County. If the 'conservative' theory that district-only voting would make things fairer to them held any water, then Council District #3 should be the "fairest" with only 20% of the registered voters living in Bellingham. Carl Weimer won his County Council District 3 seat with a majority of votes in his district in the 2005 countywide election. The Whatcom County Council was considering asking voters to reconsider district-only elections. The Bellingham Herald editorial board urged the council to respect voters’ previous decision and not raise the question for a public vote again. Who would have won, had there been district-only voting at the time, was incorrect and the options for the council were not clear in an editorial headlined “County should leave district voting alone” on page A7 in the Opinion section of the Dec. 4 edition of The Bellingham Herald. We correct errors of fact promptly and courteously. If you have a correction or clarification, please call Executive Editor Julie Shirley at 715-2261. Further... this year, the first time we had district-only voting for County Council positions, 'conservatives' didn't put forward any candidate to run against moderate independent Barbara Brenner. In Council District 2, conservative (and BIAWC yes-man) Sam Crawford won re-election after a tough race and he wouldn't have won were it not for the heavily conservative/Republican urban voters in the City of Lynden. What makes 'conservatives' unsuccessful politically isn't discrimination, it's their angry, selfish, mean-spirited, unworkable ideas. Bellingham Herald Editorial Wrong About Charter Change! Though we did not like the move to district-only voting, citizens of this county chose, through their ballots, to make that system part of the Whatcom County Charter. Changing that system back after one election without the consent of the citizens seems rash and presumptive. That's wrong, wrong, wrong? I talked to the Heralds Opinion Editor Scott Ayers on the phone and he said he thought some Council members had said they wanted to return to county-wide voting by passing a resolution. While we were on the phone he looked for the Herald news article he thought had said that, but couldn't find it. Scott said he would look into it further and bring it up at this afternoon's staff meeting. I've talked with Scott Ayers more than once and I don't have the impression that he has any sort of bad intentions or a secret agenda. However, I do think publishing an editorial based on half-remembered unverified information on the day of the Council meeting is a huge disservice to the community. The facts are that the County Council can't amend the Charter and the Council members know that. They can however, pass an Ordinance that would send a proposed Charter amendment to the voters and that is what Council members have been talking about doing. The Ordinance that Councilwoman Brenner is putting forward tonite would send the question to the voters on next years ballot. It would ONLY put the question on the ballot and NOTHING ELSE. The Whatcom County Charter DOES NOT allow the County Council to amend the Charter. The council can only put a proposed amendment before the voter. Section 8.21 Amendments by the Charter Review Commission. The Commission may propose amendments to the Charter by filing such proposed amendments with the County Council who shall submit the amendment to the voters at the next November general election at least ninety (90) days after the filing and registration of the amendments. Section 8.22 Amendments by the Public. Section 8.23 Amendments by the County Council. There is no way for the County Council to change the County Charter without going to the voters... And no one on the Council was EVER trying to go around the voters. Democracy, Whatcom Republicans Don't Like It! Passage of this Ordinance won't change the Charter, it will send the question to the voters next November. Councilman Sam Crawford is the only one who has publicly stated that he is against the ballot measure. Crawford said previously he believes he benefited from district-only voting in the November election against challenger Ken Mann. 2. )Republican activist Charlie Crabtree wrote the "VOTE BY DISTRICT - PRO" position in 2005. 4.) Republican activist Charlie Crabtree co-authored the "VOTERS' PAMPHLET - CON" position in 2005. It sure sounds like Sam Crawford and the Whatcom Republicans pulled a fast-one in 2005, slipping through District-only voting under a vague ballot title. With the local voters pamphlet having passed in spite of their opposition, it's no wonder they're trying to cut-off revisiting the issue of District-only vs. County-wide voting by trying to pressure Council members. Whatcom County Council member Sam Crawford posted a comment pointing out that I had incorrectly named him as the author of position statements on two of the 2005 charter amendments. I've edited this post to correct the error. And... A day late but, Happy Birthday Sam.